Scattered severe storms brought heavy rain, hail and lightning Wednesday, and a chance of showers and storms remains Thursday, so flooding remains a concern in the D.C. area. 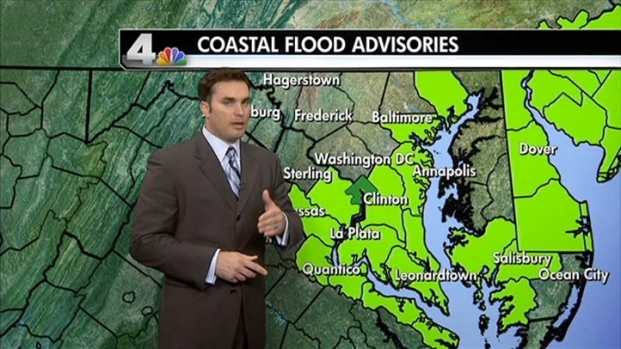 A costal flood warning was issued for D.C. and Alexandria, Arlington and Falls Church in Virginia. It's set to expire at 6 p.m. Friday. Tides are running a foot-and-a-half above normal levels and that's expected to increase to 3-4 feet above normal within the next couple of days as freshwater flows downstream toward D.C. According to the National Weather Service, Washington Harbour, which flooded earlier this season when the floodgates weren't closed, will be threatened. That large, persistent area of low pressure continues to pump in moisture off of the Atlantic Ocean over our region this week. NBC Washington meteorologist Doug Kammerer does not expect rain to wash out the Thursday morning commute, but scattered showers and storms are likely throughout the day, though like the past two days, they won't hit everywhere in the area. Strong storms are possible again late in the day Friday. Many area creeks and streams are or will be running high or will in fact flood as the runoff from these heavy showers fills those areas. If you are in an area prone to flooding, you will likely see some flooding, Kammerer said. Get the latest forecast from meteorologist Doug Kammerer. A flash flood watch has been issued for the D.C. region from 10 a.m. Thursday to 10 p.m. River flood warnings are in effect into Thursday, Friday and Saturday for counties north and west of D.C.
A coastal flood advisory is in effect until 2 a.m. and a coastal flood watch is in effect through Thursday afternoon for Prince George's, Baltimore, Harford, Anne Arundel, St. Mary's, Calvert and Charles counties in Maryland; and Manassas, Manassas Park and Prince William, Fairfax, Stafford and King George counties in Virginia. Tidal anomaly from 1-2 feet is possible through Wednesday night. Click here for the latest severe weather alerts. 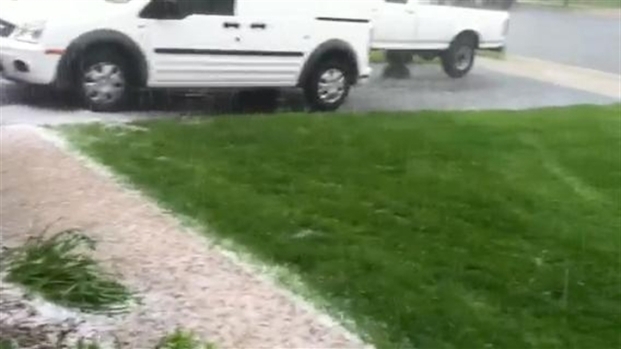 Hail Storm in Leesburg, Va.
Dan Tabler sent us this video Wednesday of a hail storm in Leesburg, Va.
At 2:35 p.m., a fire department reported a tornado near Oxford, Md., 8 miles southwest of Easton and moving north at 25 mph. Oxford Police Chief Patrick Maxwell told the Star Democrat of Easton a possible waterspout was seen around Island Creek just after 3 p.m. Wednesday. The weekend is still looking dry and warmer with afternoon highs in the low 80s Saturday and Sunday with only a very small chance of an isolated afternoon thunderstorm. Rain is likely to return next week. Kammerer said about 90 percent of Virginia and 30 percent of Maryland got rain Tuesday -- with several flash flood and severe storm warnings issued -- but the storms avoided Montgomery County, Md., and Reagan National Airport got just a hundredth of an inch of rain. Areas that did get hit saw storms capable of producing 1 to 2 inches of torrential rain per hour, as well as lightning, quarter-size hail and winds in excess of 60 mph. Tuesday night's rain turned King Street in Old Town Alexandria into a pond. Some residents said it's been years since the floodwaters rose so quickly. Businesses are sandbagging in defense with more rain on the way as streets are expected to flood again at high tide about 10 p.m. Wednesday. In Annandale, Va., water flooded part of the Beltway at Braddock Road, causing minor accidents on both the Inner and Outer loops that have since been cleared.